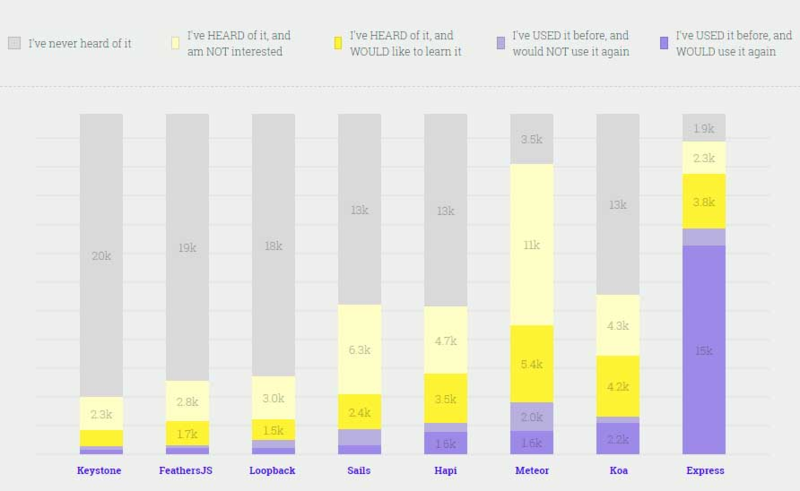 Surely if you have ever worked with Node JS you will know it since the survey is not necessary to know that Express is the most used and famous Node.JS framework. Thanks to its permanence in time and its community that we can say that it is a fairly large framework and that it will solve most of our needs in terms of serving a site, routes, templates, etc. Although this is widely used, in our opinion for very small or specific use cases, your solution may not be Express. The reason is that there are other frameworks or even quite simple libraries that if what you need is something quite small can solve it very satisfactorily. For example, to create a microservice (which can consist of serving only two routes) the library micro, available in NPM perfectly meets the need for use. Greater expressiveness in the methods, that is, that their names are clearer. Greater strength when it comes to creating web applications and API’s. Meteor goes beyond the definition of framework, can be considered a whole platform because although in its structure is a framework is able to export the written code in different environments: web, mobile and desktop. Depending on the needs of your next project Meteor can help you avoid duplicate code, especially when you are creating a web and mobile application at the same time. We also have this with React and React Native, but in this case, at least by default we need to copy and paste the code (as well as modify some other component). Something to emphasize about this framework is its integration with other solutions with which you are already working and in your landing page you can see that it is compatible with React, Vue, Angular, Mongo and GraphQL among others. The integration of the project by Meteor does not mean that you are going to have security problems, since each area is separated from the other as in any other development. HapiJS is another Node JS framework for building web applications, which as we have been seeing in statistics is catching up lately. Several books of this framework have been published as Developing a Hapi Edge. According to its own definition, this framework focuses on the fact that the code you create for your application is reusable instead of wasting time with unnecessary code. Unlike Express is structured and closed in some aspects as in the middlewares, that does not mean you can not use them but if for example you are working on a computer and you have a clear idea of ​​what you want to build Hapi will be your solution to bring prepared things that in Express you would have more open and it could be a confusion for your team. A middleware is a piece of code (function) that performs an action between it requestand the response, in the case of web frameworks that is what we are talking about. If the piece of code in another area is intermediate between two parts it can also be considered as such. SailsJS is a web framework created by Mike McNeil created with the purpose of having a structure with which to create applications for its clients, what I did not expect is that it would become one of the most used frameworks. Compared to the rest of the aforementioned, he points out that the majority of actions can be carried out with the generator which is something that not everyone likes. If you do not mind having the pre-generated code and thus gain speed when developing the application, you should try Sails otherwise you should choose another option from the list. Sure being a Nodejs Development Company we could be all day talking about all the backend frameworks that exist but is a statistical reality that these are the most used. Maybe some specific need of your project makes you opt for some other framework while there are recent updates behind this and solve your problem, is certainly a good option.